SharePoint: Using Papercut for testing the email functionality in SharePoint. In many scenarios while working with SharePoint we may come across requirement to test emails. Like email alerts, emails from workflow, timer jobs or event receivers etc. In my case I need to test emails from Timer job. While development phase it is not always possible to have a SMTP sever available to test those kind of functionality and in those scenarios Papercut is best utility available for our help. 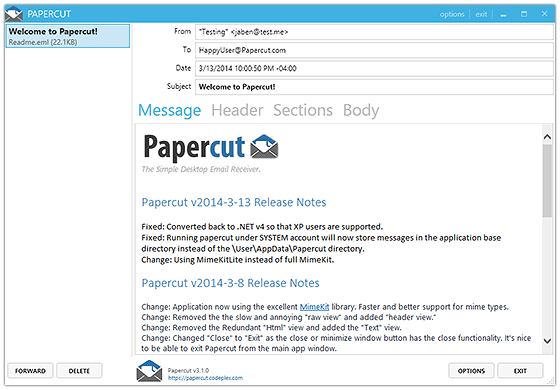 Papercut is a simplified SMTP server designed to only receive messages and serve the purpose of light weight SMTP. You can use Papercut in .Net development or SharePoint development. You just need to download and install the Papercut on your SharePoint server. 1. Papercut is only to receive emails. 2. In case of ASP.Net application provide host=”127.0.0.1″ port=”25″ in web.config file under mailsettings section. 3. For SharePoint, If you have single server farm then you don’t need to worry just install Papercut and set the ‘Outbound SMTP Server’ to localhost or 127.0.0.1 in ‘Configure outgoing e-mail settings’ under central admin, System settings. 4. You can now test by creating simple alert on any list. 5. If you have muti-server farm and testing email from timer job then need to find on which server timer service is running and on that sever you need to install Papercut also give this server IP in ‘Outbound SMTP Server’ in ‘Configure outgoing e-mail settings’ under central admin, System settings. 6. If timer service running on more than one server then make sure port 25 open between those servers to get emails from timer job. Note: complete contribution, development and license rights are with the team who have developed this and as per the http://papercut.codeplex.com/license . This post is just to make readers aware that this kind of tool exists.